As evidenced by Apple's legal troubles in Europe, our friends across the Atlantic don't see the whole "antitrust" and "license agreement" thing like us Amer'cuns. Thus, PearC: the Hackintosh cloner that just might survive. 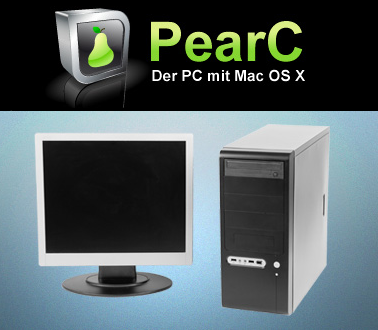 PearC is essentially offering exactly what Psystar is here in the states—build to order Intel hardware in three performance grades, from a €500 Pentium Dual Core machine analagous to the Mac Mini on up to a Core i7 Extreme screamer with every BTO option you would want—all with OS X 10.5 pre-installed. 7. Is it legal to Mac OS X on a PC to install? We would not offer our PearCs if we would not think that it is legal. Also related to the legality of the situation is that you can presently only place in order if you're also in Europe (Germany, Belgium, Denmark, Finland, France, Greece, Ireland, Luxembourg, Italy, Netherlands, Austria, Poland, Portugal, Spain, Sweden, and the UK, to be exact). And you can only make an order via wire transfer or COD, which doesn't bode well, unless that's the way things go in krautville and I just don't know about it.